Chance Hardwick, the fictitious star of the breakout film Plains and Hills, is widely considered the greatest, most charismatic young movie actor of the postwar generation. However, his meteoric rise to fame and his tragic demise have remained an inexplicable puzzle to all who knew him, as well as to his millions of fans around the world. But all these years later, famed producer and film historian Gordon Frost has gathered Chance's family, friends, lovers, and colleagues--all the people who loved and loathed him--to tell his story and try to come to terms with the elusive, unknowable figure who continues to haunt their lives. The oral history he's pieced together uncovers the secret life of one of America's premier talents. From Chance's humble Midwestern beginnings, to his time in New York as an acting student, and finally his turn as a Hollywood icon, all the pieces fit together--or so it would seem. But who is Chance Hardwick really? And moreover, who is the mysterious woman watching over his grave each year on the anniversary of his death? Narratively inventive and always engaging, The Woman in Black spans America in the 1950s in its exploration of film, fame, and how well we ever really know each other. 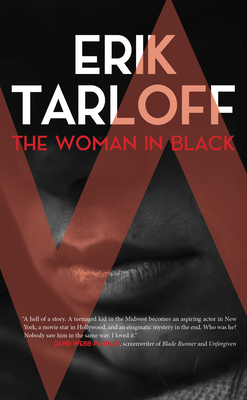 Erik Tarloff has written for the stage, the screen (both large and small), and publications like Slate, The Atlantic, The New York Times, The Washington Post, The Financial Times, Prospect, Vogue, and many others. He contributed to speeches by Bill Clinton and Al Gore. He currently lives in Berkeley, California, with his wife, economist Laura Tyson. This is his fourth novel.